I wake up ready to go. Day one wasn’t so bad. I’m working at home in the morning and going into the office late. I take that time to make Vietnamese rice porridge. 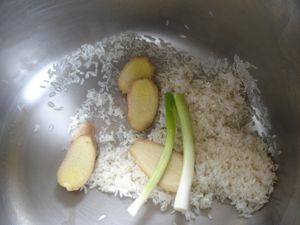 This is a brilliant dish involving a very small amount of white, long grain rice, a lot of chicken broth, a few coins of ginger, and two green onions. So few ingredients to make a magical dish that is intensely satisfying. It’s like alchemy with rice. I learned this dish from Andrea Nguyen’s Book, Into the Vietnamese Kitchen. It’s one of my favorite cookbooks and I’m deeply appreciative that I have the time to make this at home before heading off to work. I’m noticing that I’m eating my breakfast with great concentration. Seems I’ve banished mindless eating in one day. A bowl of the above porridge with a little cilantro and sliced green onion. I also threw in just a bit of the shredded chicken I’d cooked a few days before. I was really hungry after work so I had a piece of bread with peanut butter and went off to yoga class. I felt a bit weak during the class and came home famished and ready to throw together a quick rice noodle pasta dish. Dinner: I used half the bok choy that I bought for $1 and some rice noodles from my Food Bank pantry list. In addition, I sauteéd the other half of the onion from the soup broth, a bit of ginger, and a bit of garlic. 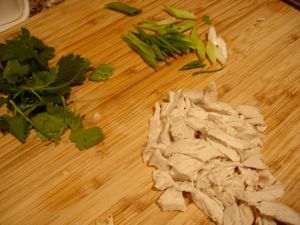 I also used just a few shreds of chicken and some soy sauce from the pantry. I garnished the pasta with cilantro and green onion (I’m now thinking these two items are some of my smartest purchases). I notice that I’m taking no pleasure in cooking. I just want to get it done and into my mouth. I usually take my time and listen to music and relax. I just want to eat. I find this interesting. I eat really fast and somewhat resentfully. I realize that I’m only about 80% full. Funny, this is a habit I’d been trying to master and finally I’m doing it. There's a bottle of wine in the house so I decide to have a glass. My cushion right? I'm also drinking one cup of coffee a day. I tell myself my cushion allows that too and it actually does, depending on what else I need the cushion for. I’m hungry again before bed so I have a piece of toast with butter. This entry was posted in Asian, Books, breakfast, food justice, healthy, hunger challenge. Bookmark the permalink. Post a comment or leave a trackback: Trackback URL.